From the anterior portion of the body of sphenoid each lesser wing originates via two roots. The optic canal is located in the middle of these two roots. The protuberant medial terminations of the lesser wings are referred to as anterior clinoid processes. The anterior termination of the tentorium cerebelli which is the dural roof of the cerebellum connects here. The tentorium cerebelli attaches anteriorly to anterior clinoid processes. It is a layer of dura that divides the posterior portion of the cerebral hemispheres from the cerebellum. Ophthalmic artery is branch of the internal carotid artery. It originates from internal carotid artery as it arises medially towards anterior clinoid process near the optic canal via the roof of the cavernous sinus. With each of them being located within a common dural sheath, the artery enters the orbit via optic canal inferolateral towards the optic nerve. 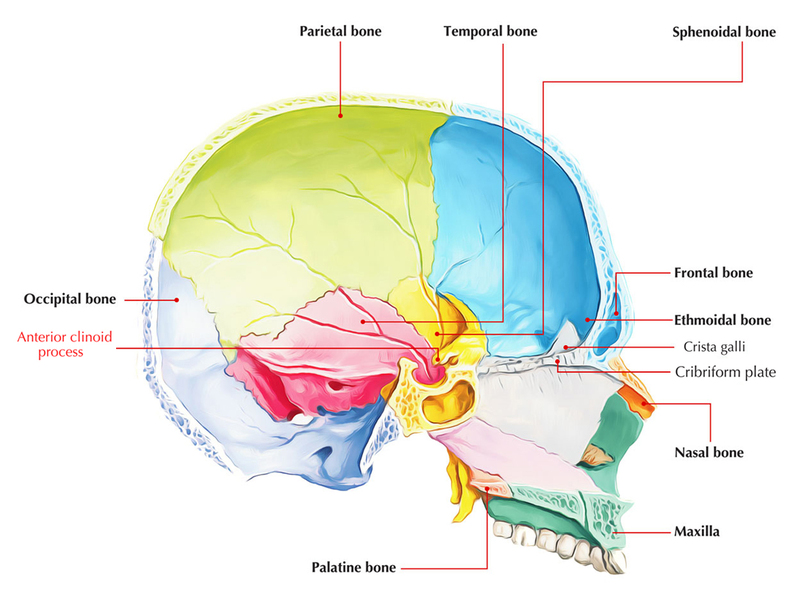 The anterior clinoid process indicates the point of convergence in the middle of posterior free margin and anterior margin of anterior cranial fossa. The carotid groove originates at the foramen lacerum and terminates medial towards the anterior clinoid process. Occasionally for the passage of internal carotid artery, the middle and anterior clinoid processes are merged via a bony bar and a caroticoclinoid foramen is created.